Last update : 26 April 2019. Our SeedBoxBay review was maybe one of the most pleasant to do as this provider is really likable to use. In fact, as you’ll have time to see during our in-depth SeedBoxBay review, we were really pleased by the very good client support. Furthermore, even though this is not the best Seedbox provider on the market, you’ll still have very competitive an offer and it will be perfect for people who are looking for small disk spaces. 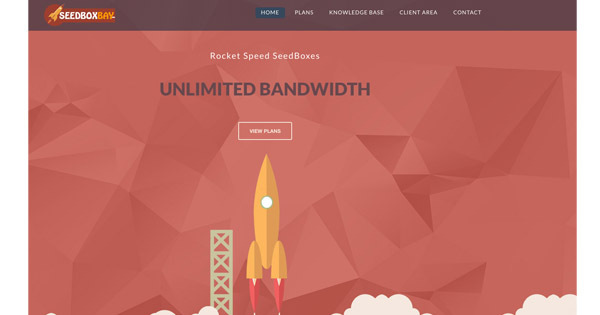 If you want to discover the reasons for which we like this provider so much, discover our in-depth SeedBoxBay review in which we’ll look into 4 relevant criteria to help you know everything you should about this Seedbox provider. In order not to change our mantra, let’s start this SeedBoxBay review by having a close look to the client support. As far as this is concerned, we were extremely satisfied. As a matter of fact, as many (or all) of its competitors, this Seedbox provider offers a 24/7 client support. In order to contact them, you’ll have two solutions. The first one is by opening a Ticket and this is something we can see everywhere. The second option, which is way more interesting, is to go through Skype. This is so useful because you’ll be able to call them for free no matter in which country you’re living. This really pleased us, hence our very positive SeedBoxBay review in this section. If ever you’ve got a tricky problem to solve, we highly recommend you to go on Skype where you’ll be able to make an audio call for free. This is faster and easier than using a Ticket which might take longer to solve your problem. Our SeedBoxBay review is really positive as far as this mean of communication is concerned. For the time being, this is the only provider we’ve tried which offers this solution. Furthermore, the quality of the support is really good and the employees are really friendly. When it comes to waiting time, it is really good too. Indeed, be it at 3pm or 3am, you’ll get an answer within a few minutes only. The answers we got were always really clear and detailed and our questions or problems were always answered/solved. In the end, our grade for this first section of our in-depth SeedBoxBay review is really good. Indeed, we gave it a 9.8/10. We did not go to 10/10 because this awesome grade is booked for our number 1 : RapidSeedBox. The latter offers an even better client support which will answer within a few seconds only on its very good online chat. Furthermore, the employees come over as a bit more « human » and we really liked talking with them. Yet, SeedBoxBay also offer an awesome performance. The only difference which explains the difference of 0,2 in the grade is the waiting time for the answers. In the next section of our in-depth SeedBoxBay review, we’ll look into the choice of VPS. Second criterion of our in-depth SeedBoxBay review, the choice of Seedboxes is here too restricted according to us. Indeed, first, you’ll only be able to choose between 3 different packages. The first has 100Go of disk space, the second has 220Go and the third has 450Go. If we go into details, the « basic » offer is the Baby for which you’ll pay 5$ for 100Go of storage each month. This is perfect for someone who’s just starting with Seedboxes, but it is definitely too small for a « professional » or someone who’s got a lot of data to store. In fact, as many people use Seedboxes as external disk, a 100Go space won’t be very pleasant… Instead of storing all your photos, videos, documents on an external disk that you’ll pay 500$ and that can easily crash, you can rent a Seedbox. This is safer and way cheaper. Yet, here, what explains the pretty bad grade in this section of our in-depth SeedBoxBay review is the fact that people who really want to store data won’t find anything that suits their need. In fact, the second offer, the « Seeder » is only 220Go and the biggest, the « Torrent Master » is only 450Go… This is really limited. If you compare with Seedbox.fr, or even with DediSeedBox, their smallest offer is bigger than the biggest of SeedBoxBay… This is a bit of a shame according to us because people who want big storage will go away directly. Furthermore, unfortunately, there is no dedicated serveurs here for people who might be interested. In the end, the choice is really limited to these 3 VPS. Finally, our grade for this section of our in-depth SeedBoxBay review is 7.8/10. This is still correct because we took into account the fact that this provider is aiming at people who want small Disk spaces. For them, SeedBoxBay is definitely a good solution. Yet, we still think that it is not a very good strategy because it alienates all people who are looking for big VPSs. In the next section of our SeedBoxBay review, we’ll look into the quality of the interface. As far as the quality of the interface is concerned, we’d like to start this section of our in-depth SeedBoxBay review with the very good availability of your Seedbox which will be installed directly when you order it. In fact, during our test, we never met any dysfunction with our Seedbox and it perfectly worked during our 1 month test. Furthermore, you won’t have any bandwidth limit, which is very likable. The same goes for the number of simultaneous active files ! In other words, you’ll be able to download and share without any limit be it in terms of quantity of data downloaded or shared or in terms of simultaneous active files. This is something we really enjoyed and that mattered for our SeedBoxBay review. Furthermore, like most of its competitors, your connection will remain perfectly anonymous thanks to OpenVPN which is included on all packages. People who want to download won’t have any reason to be scared. They’ll be able to keep their files on the Seedbox or to download them on a computer via FTP or HTTPS protocols. The negative point about the quality of the interface is maybe the 1Gb/s connection. Even though it is very very good, it is no match for Seedbox.fr and its awesome 10Gb/s connection. Actually, this won’t change anything on small files transfers. Yet, for bigger files, you’ll definitely see the difference. Still, this 1Gb/s connection speed will enable you to download a 3GB movie in less than a minute which is just too sick ! In the end, our grade in this section of our in-depth SeedBoxBay review is 7.8/10. In the next one, we’ll have a very close and detailed look to the tarification and the 72 hours of money back guarantee. Our SeedBoxBay review is already ending and, as always, we’ll have a close look to the tarification of these 3 solutions. As far as cheap prices are concerned, it is definitely not here that you’ll find the best ones… Indeed, the $/Go ratio is quite bad…even though the prices are not too high. This is due to the fact that the disk spaces are very limited as we saw in the beginning of this SeedBoxBay review. Indeed, even though the first price is only 5$ a month, it is still very expensive if we look at the $/Go ratio. This is for this reason that our grade for this last section of our SeedBoxBay review is not that good. The basic offer is 5$ / month for 100GB of disk space which makes 5 cents$ / GB stored. This is very expensive. Remember that the cheapest, such as DediSeedbox, Seedbox.fr or Seedbox.io are very close to 1 cent$ / GB. The second solution is 8$ for 220GB of storage which makes 3,6 cents$ / GB stored which is still quite expensive. As far as the means of payment are concerned, you’ll be able to choose between VISA, Mastercard, PayPal or Bitcoin. In other word, you’ll have the mean of payment ! 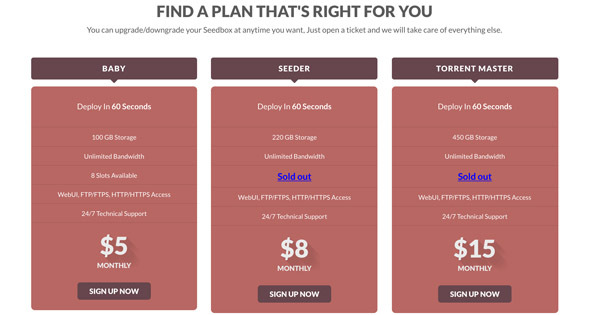 Also note that if you want to try one of these Seedboxes, you’ve got 72 hours money back guarantee. That means that you’ll have to pay and rent one Seedbox but you have 72 hours to cancel the subscription if it does not answer your needs. In the end, our grade in this section of our SeedBoxBay review is 8/10. In fact, even though the $/Go ratio is bad, the prices are still quite low (because the disk spaces are small). Just below, discover a very short summary of the strengths and weaknesses that we’ve presented during this in-depth SeedBoxbay review. Pros : The very good client support available 24/7, the quality of the interface and the cheapest Seedbox at only 5$. Cons: The very restricted choice of VPS, the 1Gb/s connection speed and the tarification. Even though this is not the best Seedbox provider on the market, our SeedBoxBay review is still very positive. In fact, this provider offers a very good and reactive client support available 24/7 and a high-quality offer. As we’ve seen, we can criticize the fact that there is a very limited choice of VPS and the 1Gb/s connection speed is no match for Seedbox.fr’s 10Gb/s speed.